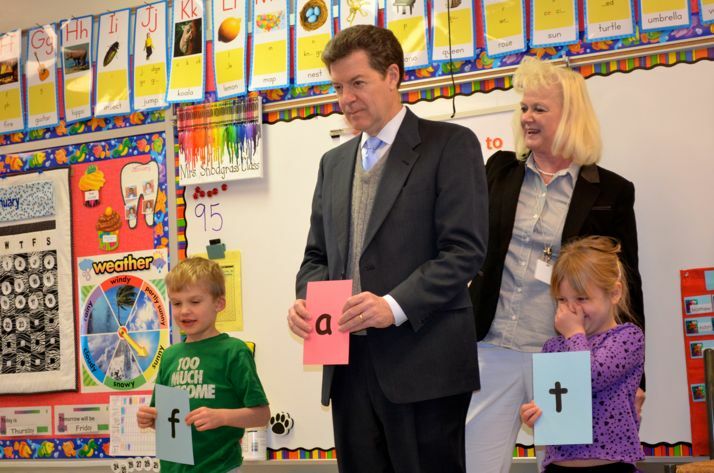 Kansas Governor Sam Brownback during a 2014 visit to Roesland Elementary. The block grant school funding bill he signed in 2015 is one of the main drivers behind a cut in federal Title 1 funding that’s prompting Shawnee Mission to de-classify Roesland as a Title 1 school next year. In 2015, the Shawnee Mission School District’s top administrators broke ranks with local education advocacy groups, including the SMAC PTA, and many area legislators in voicing public support for the “block grant” approach to school funding that then-Gov. Sam Brownback said would provide a “timeout in the school finance wars”. That block grant approach to school funding, which went into effect in 2016, was ultimately declared unconstitutional by the Kansas Supreme Court. And, it turns out, it’s among the primary drivers behind the reduction in Title 1 program funding Shawnee Mission is grappling with today. The Title 1 program provides funding to schools with high concentrations of economically disadvantaged students so that they can offer services above-and-beyond what’s offered at non-Title buildings. In Shawnee Mission, Title 1 funds are used to support positions like reading and math specialists who can help struggling students get their skills up to grade level. The U.S. Department of Education allocates Title 1 funding to states each year based on a formula that factors in a number of variables, including how much money the states spend on education per pupil each year and poverty data from the U.S. Census Bureau. The way the formula is written, states that spend more money per pupil on education are rewarded with more Title 1 funding. States that spend less are penalized. The federal government uses the most recent available data on per pupil spending to determine Title 1 allocations, and when it applied the formula for the 2018-2019 school year, the most recent per pupil spending data it had was from 2016 — the year Kansas’s block grant bill went into effect. While state per pupil expenditures that year were up an average of $143 across the country, Kansas’s state spending per pupil under the first year of the block grant bill was down $117. Additionally, Kansas saw the number of children living below the federal poverty line decrease, which further reduced its Title 1 allocation. So while the bucket of federal funding available for Title 1 support actually increased by about 2 percent — or more than $300 million — for this school year, Kansas saw its allocation drop by nearly 9 percent, or more than $9.5 million. No other state saw a percentage reduction in Title 1 funding as large as Kansas. 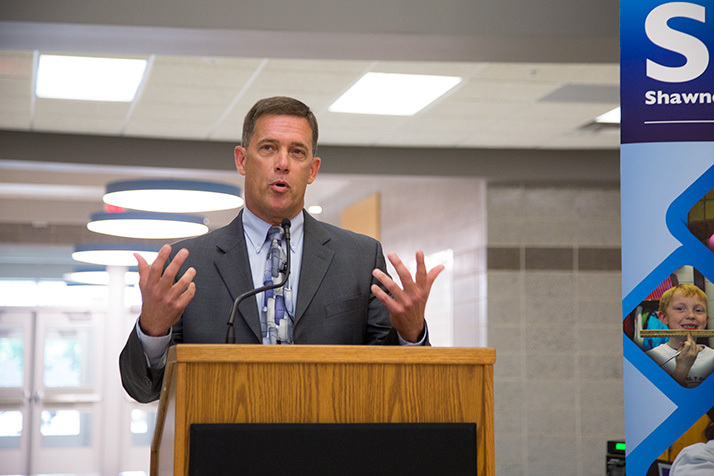 Superintendent Jim Hinson stood out among education leaders in having Shawnee Mission voice public support for the block grant bill in 2015. But, she said, she was more than a little miffed that then-Superintendent Jim Hinson had the district issue a public letter in support of the block grant bill. Hinson’s rationale — which was echoed at the time by Prairie Village Sen. Kay Wolf — was that the funding formula in place since 1992 sent Johnson County tax dollars out of the community and to school districts in other parts of the state. The “timeout” the block grant bill offered was a chance to craft a funding formula more favorable to Johnson County’s districts, they said. Deedy and others questioned whether the bill would be deemed constitutional, though, saying that because it did not account for changing enrollment figures or demographics the “steady” funding it promised was actually a “functional cut.” The Supreme Court ultimately agreed with those who opposed the bill. Though there were plenty of arguments against block grants at the time, Deedy said there wasn’t any talk among either proponents or opponents of the bill about what future impacts it might have on Title 1 funding. Deedy said unintended negative consequences from the bill linger. 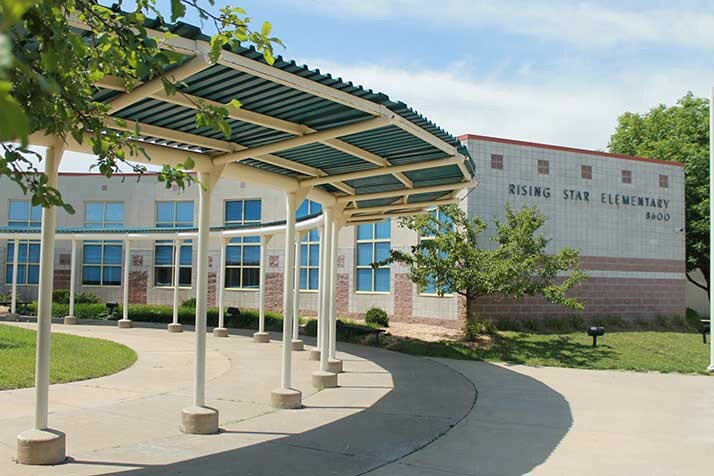 Rising Star Elementary will lose its Title 1 designation next school year. Dean Zajic, coordinator in the Kansas State Department of Education’s Special Education and Title Services division, said Kansas can expect to see its Title 1 allocation rise back up into the middle of the pack of states for the 2020-21 school year, when the most recent per pupil spending data will be higher. “As we get out of block grant years, we would expect the Kansas portion to go back up,” Zajic said. But, as it stands now, Shawnee Mission is staring at a budget gap of around $1.095 million for its Title 1 program next year. Last week, district staff laid out a plan to pare back Shawnee Mission’s Title 1 program to account for the projected funding gap. Those plans include the declassification of five current Title 1 schools — Bluejacket Flint, Broken Arrow, Pawnee, Rising Star and Roesland. Michelle Hubbard, the district’s assistant superintendent for leadership and learning, indicated that the practical effects of declassification will be the loss of one to three staff members at each building, including reading and math specialists. Deedy cautions Shawnee Mission patrons frustrated by the cuts not to cast blame on the administrators currently trying to find a solution.